Penne with bacon and cream. This is what we had for dinner the other night instead of macaroni and cheese. On a freezing late afternoon my teenage son mentioned how “cozy” it was in the house and he wanted a bowl of macaroni and cheese. We checked the refrigerator and did not have enough of the right type of cheese. 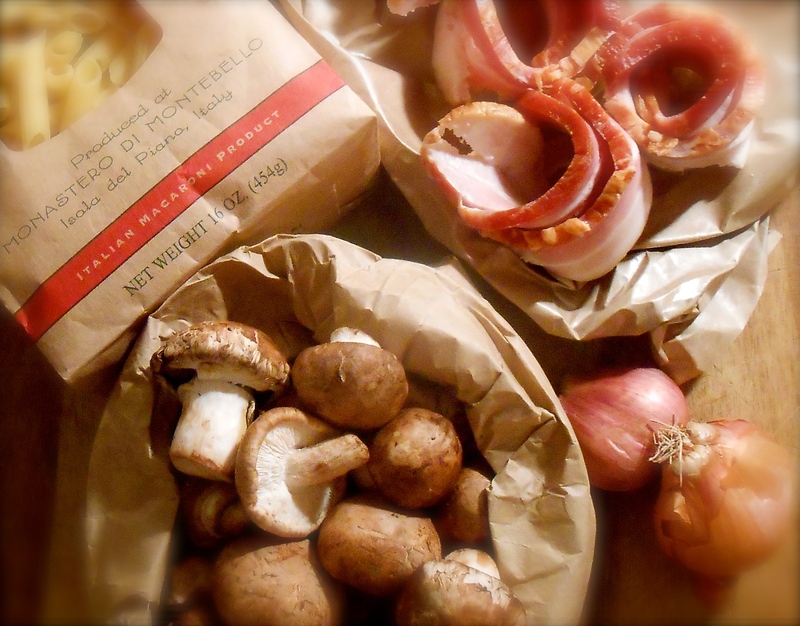 However, what we did find was a bag of cremini mushrooms, bacon and some heavy whipping cream. I know, it’s the New Year and we are suppose to be eating light. How do you tell that to a 15 year old young man who eats constantly?! He agreed with the prospect of this combination and I was happily pulling the pots out as well as the chopping block. Perhaps the combination and texture of this sauce would be better with another pasta shape. I only had penne on hand so finely chopping the mushrooms helped the bits find their way into the pasta tubes. This is another recipe inspired by the late Marcella Hazen. 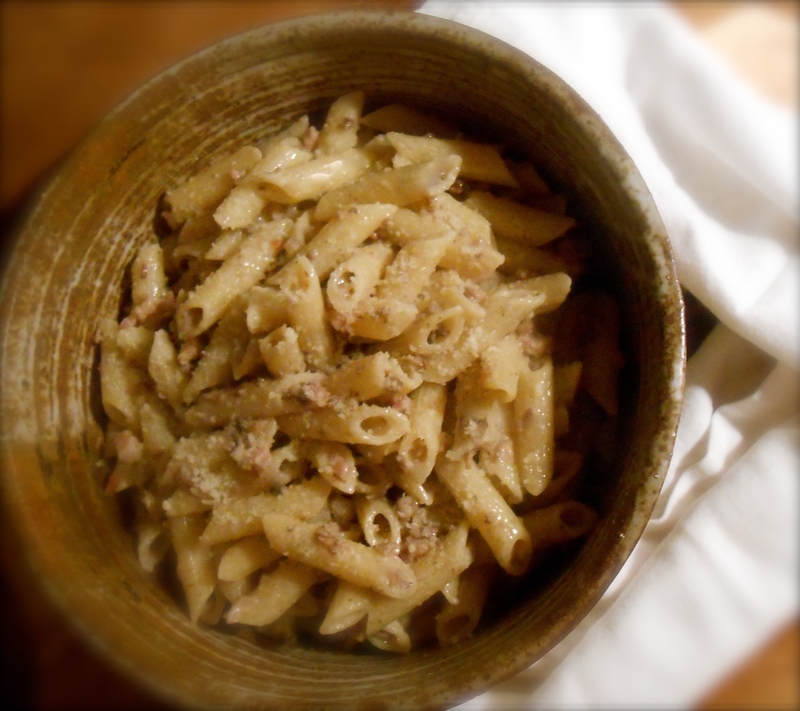 If you are craving a comforting carbonara type sauce this is it. Eggless and wonderful. Wash, dry and finely chop mushrooms and set aside. Place a large skillet on medium heat and add the butter and finely chopped shallots, cook until soft. Turn up the heat and add the mushrooms. Stir thoroughly to coat well. Add salt and a few grindings of pepper, turn up the heat to allow the liquid from the mushrooms to boil away, stirring frequently. Turn the heat back down to medium, add the bacon and stir while it cook for about a minute or two. Add the cream and cook just long enough for the cream to become reduced and slightly thickened. Taste and correct for salt and pepper. Turn off the heat. Set aside. Choose an enameled cast-iron or other flameproof serving pan that can later contain all the pasta without piling it high. Put in the 2 tablespoons of butter and 1/4 cup cream for tossing the pasta, and turn on the heat to low. When the butter melts, stir to amalgamate it with the cream, then turn off the heat. Drain the pasta when done, reserving one cup of the liquid. Transfer the pasta to the serving pan containing butter and cream. Turn on the heat to low, toss the noodles, turning them thoroughly to coat them well. Add half of the mushroom sauce, tossing it with the noodles. Add the 1/2 cup parmesan, toss again, and turn off the heat. Pour the remainder of the mushroom sauce over the pasta. Check for dryness and add a bit of the cooking liquid if necessary. Serve at once right out of the pan, with additional parmesan on the side. Me too and actually I did eat a little the next morning for breakfast! :) Thank you Prudy…now go out and get the mushrooms, quick! Even in a heat wave, I want to make and eat this now. Yum! Ha! Me too…are you in a heat wave? I wish we were in a heat wave, we are in a “fever” wave. Seems like the fever has caught on and effecting so many around me! wow! Wanting to stand up and applaud here–this looks amazing :-) Hoping my kids are open to “exotic” dishes (it didn’t come from a box, haha) such as this one when they’re teenagers. As of now, they’re not big fans of anything inventive. But oh your dish looks good. Love how your culinary mind works. Looks scrumptious! Great combo of bacon and mushrooms! Thank you Ngan! You are right…bacon and mushrooms are delightful together. Bacon makes everything better :-) — and mushrooms are a close second! Bacon does! There is this fabulous local chocolate company that makes a chocolate bar w/bacon in it! Have you had that combination before? My 15 year old would LOVE this, sadly except for the mushrooms, BUT like you said they are small enough to hide inside the penne! Looks amazingly delish. Cheers! Mushrooms are “iffy” aren’t they. I only like cremini mushrooms. Despise shitake and portabella mushrooms myself. Now that’ll raise a lot of eyebrows! Looks like the perfect combination! Thank you Jess! This is actually my food heaven too…It takes great willpower to not make a pasta like this every week! It is so delicious and “comforting”. This is perfect comfort food! Nice effects with the photos. It makes me want to come over and just eat a bowl of this to refuel the soul. You said it well. “refuel the soul” because this most likely is not doing much for us nutritionally or physically! :) Can you imagine…cream and bacon? I am itching to get a better camera for sure. Thank goodness I have a program to tweak the photos a little. Certainly lacking in the visuals here! My type of pasta there. Keep it nice and simple and effing tasty! My fifteen year old son would love this! He’s such an eating machine he would probably wolf it down all by himself. Just last night he told me I should consider doubling portion sizes when I cook. I know exactly where you’re coming from. But howI love to watch him eat! I don’t even like cream but am completely drooling over this!! It looks just so damn good!! Yes, the cardiologist for sure…precisely my thought. I hesitated before posting this pasta thinking “no one’s going to be interested in such a rich, creamy pasta this time of year”. :) And agree again on the amount of sauce only enough to moisten the pasta. The boy is eating us out of house and home for sure. How about that grocery bill? Thank you Ken, always enjoy your comments. I think I like this better than mac and cheese. Teens will eat and eat and eat especially the boys and they are so active it doesn’t stick. Sounds really wonderful, love the mushrooms and bacon. Me too! I do like homemade mac and cheese but I always have to add something else to it. A vegetable, tomatoes, basil…something. I think last time I made it I added bacon. Geez, you’d think I had a pig farm over here with the amount of bacon I’ve been using. I think I’d better back off. Looks like a delicious alternative to mac and cheese. Must keep this in mind. I want to write this on my kitchen chalkboard menu – just for the name alone. Penne con pancetta e crema. Bellissimo! I won’t tell them it’s actually pasta with bacon and cream. Thank you for the constant inspiration. I love your blog! Sounds absolutely wonderful, I am making a pasta dish tonight, and will try your sauce, thank you! I happen to have some cream I need to use up so we can eat light, ha! This sounds really really great! Classic combination, that works oh so very well. Admittedly, I don’t have the patience to chop the mushrooms that small! Definitely not something one should eat every day, but it looks divine! What a great way to use what you already have in the fridge! You are right, however, it would be easy to eat this everyday! Butter, cream, bacon and mushrooms! Hmmm…sounds like a wonderful soup too now that I mention it. Way to pull together something people have to find a recipe for. I think you are just fine with the penne! This is my kind of meal. I like that you added the chopped mushrooms…they had to add a lot of flavor. Honestly, this is my kind of meal too. Especially this time of the year. There’s always spring to get the diet sorted out…right! Bacon, cheese AND cream. That is a winning combination. YUM! 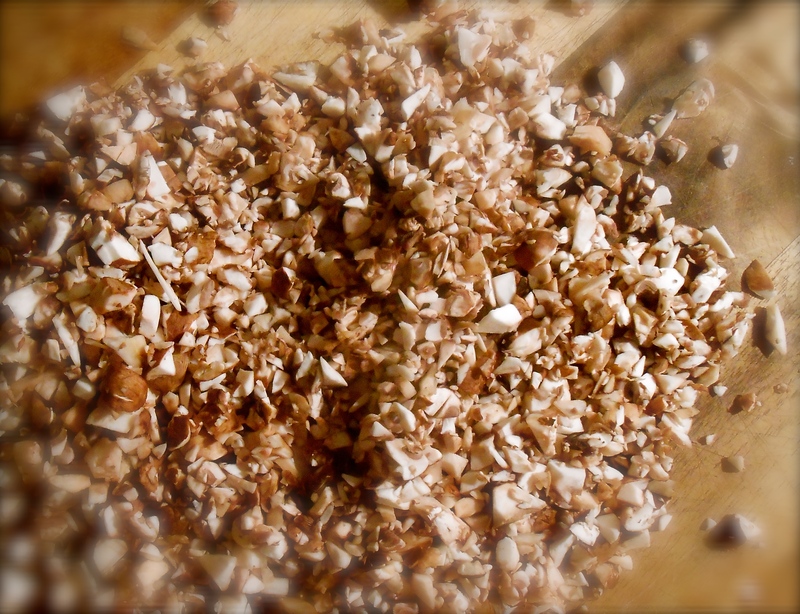 I’m also a fan of finely chopping mushrooms, mainly so they’re hidden from the children. Can’t even imagine how much a 15-year old boy would consume. My 9 year old already chows down like a fully-grown man. It’s the shoe size that freaks me out though. 15 year olds have such enormous feet! Can’t go wrong with pasta, bacon and cream! Looks so good! It sounds better than mac n cheese!!! Bravo to the 15 year old for the inspiration!! Simply delicious and cozy and beautiful in all ways. Yum. You are right, he key word here is “cozy”! I love cozy food. a great cook is one who can use whats available in the kitchen to create a great dish like this one. Absolutely my type of food. Love it! I realized there are much more imports from US over here which is a good thing :) Thank you so much! This has got to taste terrific– love those nutty mushrooms and bacon, of course. You’re photos keep getting better. love this. Thank you so much for your kind compliment! This time of the year is really difficult to photograph the dinner, isn’t it? You are currently reading penne con pancetta e crema at COTTAGE GROVE HOUSE.